You are bidding on a beautiful Return to Tiffany & Co. Oval Tag Chain 18" Necklace Choker in 925 Sterling Silver . pre-owned but good condition, please see my photos as you will receive the exact item in my photo. Item will be Shipped with USPS First Class Package. Buyer pays shipping. Weighs 61.grams. Heart & Key pendant necklace in 925 sterling silver. You will not find a finer example of this classic necklace anywhere else. Heart & Key Pendant Necklace. 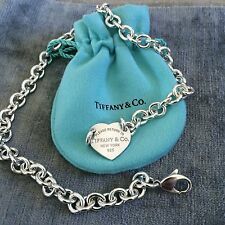 "Tiffany & Co.
New ListingTiffany & Co Sterling Silver "Return To Tiffany" Heart Tag Bead Necklace 16"
Ending May 2 at 2:13PM PDT6d 22hMetal: Sterling SilverTheme: Love & HeartsLength: 16 - 17.99"
You will not find a finer example anywhere else. NY MINI STERLING SILVER DOUBLE HEART CHARM NECKLACE. Stamped TIFFANY & CO 925. Chain approx. Tiffany Tag Choker Necklace “Please Return to Tiffany” .925 silver . Condition is Pre-owned. Shipped with USPS First Class Package. Ending May 1 at 7:51PM PDT6d 3hMetal: Fine SilverStyle: ChokerBrand: Tiffany & Co. Treat yourself to this gorgeous. F ake pieces are destroyed and sold for scrap, and anything in need of repairs goes to our jeweler. Where do we get all our Tiffany & Co Pieces???. There were 2 versions made of this necklace, one with the hallmarked stamped on the back of the heart. Designer: Tiffany & Co. We have been dealing in Designer Jewelry for over 30 years. We Are Easy To Work With. (USA ONLY). Length: 15". Ending Apr 30 at 4:11PM PDT5dMetal: Sterling SilverStyle: ChokerBrand: Tiffany & Co.
Return to Tiffany & Co. Mini Double Heart Tag Pendant Necklace 925 Silver 16"
You will not find a finer example of this classic necklace anywhere else. Size: 16 in. Designer: Tiffany & Co. We have been dealing in Designer Jewelry for over 30 years. This is a pre-owned item with Signs of Wear/use. We Are Easy To Work With. (USA ONLY). Length: 34". F ake pieces are destroyed and sold for scrap, and anything in need of repairs goes to our jeweler. Where do we get all our Tiffany & Co Pieces???. 54 grams of solid 925 sterling silver. 15.5" from end to end. For your consideration is a beautiful estate authentic sterling silver Tiffany & Co. necklace. Tiffany Co. Necklace: 16". TIFFANY & CO. "PLEASE RETURN TO" HEART TAG NECKLACE - STERLING SILVER - NO RES! Pendant size : 42mm x 21mm. Chain length : 32" (80cm). Weight : 25.8g. Other : Our gift box included. Tiffany & Co. Sterling Silver Return to Tiffany Heart Tag Choker Necklace 16"
A Stunning Tiffany & Co. New York 925. Pendant size : 30mm x 22mm. Chain length : 32". Weight : 21.4g. Other : Our gift box included. 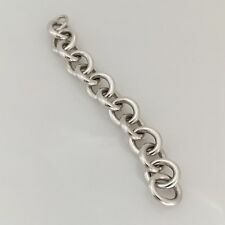 The chain has a total length of 16". It is pre-owned and in very good condition. Ending Apr 30 at 12:49PM PDT4d 20hMetal: Sterling SilverTheme: Love & HeartsBrand: Tiffany & Co.
F ake pieces are destroyed and sold for scrap, and anything in need of repairs goes to our jeweler. Where do we get all our Tiffany & Co Pieces???. 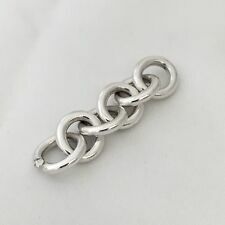 58.7 grams solid 925 sterling silver. Nice necklace. Original Tiffany piece is tarnished and could use polishing. Low price won’t last long. Bid now! Return To Tiffany & Co 18" Double Heart Blue Enamel Silver Necklace W/pouch! The chain is 18”. All of this is in 925 sterling Silver. Ending Friday at 8:40AM PDT16h 42mMetal: Sterling SilverBrand: Tiffany & Co.
Necklace with Box. In Tiffany & Co. Box (no bag). Livermore Coin & Bullion, Inc. 925 Sterling Silver. We Will Always Disclose Any Issues There May Be with an Item, We will Never Mislead You Just to Make a Sale. Return to Tiffany & Co Mini Double Heart Tag Pendant Necklace Enamel Silver Pink. Condition is Pre-owned. This is a beautiful piece and it’s in great condition, it has only been used a couple of times. This is an authentic piece and tested. If you have any questions please feel free to contact me. Also please look at the pictures for better visual detail. TIFFANY & CO. We will do everything within our power to quickly resolve your inquiries. Ending Apr 28 at 5:03PM PDT3d 1hBrand: Tiffany & Co.
Tiffany & Co Return To Tiffany Silver 5 Five Multi Hearts Dangle Lariat Necklace. Condition is Pre-owned. Shipped with USPS Parcel Select Ground. Goes with everything- as perfect with a t-shirt as it is with a little black dress. Excellent preowned condition and recently polished. Ending Saturday at 8:38PM PDT2d 4hMetal: Sterling SilverStyle: ChokerLength: 13 - 15.99"
Return to Tiffany & Co Oval Tag Necklace Choker 925 Sterling Silver - 15.5"
Ending Apr 29 at 2:46PM PDT3d 22hMetal: Sterling SilverStyle: ChokerLength: 13 - 15.99"
Tiffany & Co 18K Gold "Return To Tiffany" Heart Tag Pendant Necklace 20"
Pre-owned piece. I included a close up picture- the only good news is the necklace chain covers it. The necklace chain is n good shape, but you can see wear on the pendant on both sides but the "Tiffany & CO" side is worse. 1.5" (6 links) of Authentic Tiffany & Co Chain Links for the Tiffany Necklaces shown in the photos. F ake pieces are destroyed and sold for scrap, and anything in need of repairs goes to our jeweler. Just Polished Tiffany&Co. Return to Tiffany Mini Double Pink Heart Necklace-16"
You are looking at a very gently used Tiffany and Co. Please Return To Tiffany & Co. Sterling Double Mini Enamel Heart Necklace 16"
New York 925 Necklace. Condition is Pre-owned. Ending Friday at 1:14PM PDT21h 16mBrand: Tiffany & Co.
Tiffany & Co Sterling Double Return to Tiffany Heart Necklace Pink Pendant . Condition is New with tags. Shipped with USPS First Class Package. Please Return To Tiffany & Co. Sterling Double Mini Enamel Heart Necklace 18"
Hallmarks: Tiffany & Co. Other: A Tiffany pouch is included. Size: 18" Long, Each heart is approx 10mm wide. Hi you are bidding on a Tiffany & Co. Please Return to T&Co New York Small Heart Sterling Silver .925 Necklace with original box. This necklace pendant is 18” inches long with a small heart used but looks like new. Good luck on your bidding and have a great day. Authentic Tiffany. NEW YORK 925. Stamped on hook: AG925/TIFFANY & CO.
Return to Tiffany & Co Oval Tag Chain Necklace Choker 925 Sterling Silver Pouch. Condition is Pre-owned. Shipped with USPS First Class Package. Ending Apr 29 at 3:59PM PDT4dMetal: Sterling SilverStyle: ChokerLength: 13 - 15.99"
Return to Tiffany & Co Oval Tag Chain Necklace Choker 925 Sterling Silver. Comes with iconic blue Tiffany cloth bag. Condition is Pre-owned, but very good condition. Has been stored in its original bag essentially since purchase. No major defects or flaws. Shipped with USPS Priority Mail. Ending Apr 28 at 8:01AM PDT2d 16hMetal: Sterling SilverStyle: ChokerLength: 13 - 15.99"
Return to Tiffany & Co. Mini Double Heart Tag Pendant Necklace 925 Silver 18"
You will not find a finer example of this classic necklace anywhere else. Size: 18 in. Tiffany & Co .Sterling Silver Return to Tiffany Round Pendant Necklace 16-18"
Style: PendantBrand: Tiffany & Co.
TIFFANY & CO. Please Return To Tiffany New York 925 Oval Tag Necklace . Condition is Pre-owned, pristine condition with zero scratches. Polished regularly and ready to be gifted. Box and pouch included. I keep all of my Tiffany jewelry in boxes and numbered, that aligns to list-so there is a small number 6 on the bottom of the box. Shipped with USPS First Class Package. The closure is a lobster claw hallmarked 925. This is a marvelous choker necklace with a distinctive look from Tiffany & Co. Designer: Tiffany & Co. Closure: Lobster Clasp. From the famous jeweler's, Tiffany & Co of Fifth Avenue, New York. The Tiffany box and pouch are included. oval pendant on a 34" silver ball chain. New ListingTiffany & Co Silver Return To PINK Enamel Color Splash HEART Tag Charm Necklace. Tiffany & Co Silver Return To PINK Enamel Color Splash HEART Tag Charm Necklace.. Shipped with USPS First Class Package. Sterling silver/925. Can be used as a pendant or a bracelet charm. Medium size. Can be taken into any Tiffany's for authentication and complimentary cleaning. ESTATE RETURN TO TIFFANY & Co. STERLING SILVER OVAL TAG NECKLACE-15" 925-NICE!